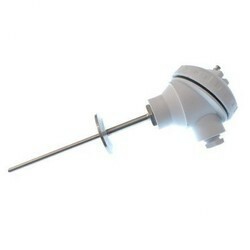 Diameter range 0.5" / 1" / 1.5" / 2"
We are leading Manufacturer of Sanitary RTD Sensor and our product is made up of good quality. This range of RTD is widely used in food, dairy, beverage, pharmaceuticals and chemical process where avoiding contamination and maintenance of hygiene is of great concern. This RTD sensor is light in weight and easy to install due to its integrated cable assembly.Triclover connections are available in 1.5”, 1” and 0.5 “ sizes and are made of SS316L grade material. Capable of measuring temperature -50 to 250°C range. PTFE insulated cables rated for temperatures up to 250 °C are provided. Optional overall SS braiding on cable can be provided for protecting cable from mechanical damage and for additional thermal safety. RH607 and RH627 are sanitary RTDs with tri clover process connection. Triclover connections are available in 1.5”, 1” and 0.5 “ sizes and are made of SS316L grade material. These RTD sensors are offered in 4/3/2-wire configuration with single/ dual element enclosed in SS316L sheath which is terminated into weatherproof die cast aluminium head. Terminal head is supplied with standard 1/2” BSP (F) single cable entry with single compression cable gland. The RTD has a non-bendable sheath hence sheath length above 300 mm is not recommended. 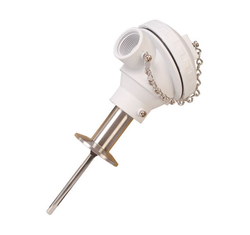 Capable of measuring temperature in the range of -50 to 250°C. Dual cable entries and double compression cable glands are optional. Straight Stems 1/4", 3/8", 3/16"
We are leading Manufacturer of Sanitary RTD Sensors and our product is made up of good quality. This range of RTD is widely used in food, dairy, beverage, pharmaceuticals and chemical process where contamination cleanliness is of great concern. RH601 RTD comes with threaded female nut made of SS316L grade material. 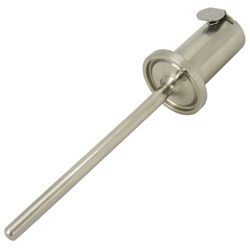 This RTD is offered in 4/3/2-wire configuration with single/ dual element enclosed in SS316L sheath which is terminated into weatherproof die cast aluminium head having1/2” BSP (F) single cable entry with single compression cable gland.. Looking for Sanitary RTD ?